Louis van Gaal thinks he will still be Manchester United manager next season. The Dutchman has not been given any assurance on his future but he expects to be serving the final season of a three-year contract he signed in 2014. He said: "I have said I shall be here, that is my opinion, so the board has to decide if it is like that." Van Gaal has been under intense pressure since December and former Chelsea manager Jose Mourinho is known to have spoken with United officials. United, who announced record third quarter results on Friday and said they expect overall revenue to pass £500m for the year, know they will miss out on the Champions League for the second time in three seasons if Manchester City avoid defeat in their final game at Swansea on Sunday. With a place in the FA Cup final against Crystal Palace on 21 May already assured, Van Gaal says taking the battle for a top four place to the final game represents some degree of success. "We can win the FA Cup," he said. "And we are still in the race. How many teams can say that? Not many. Our aim was to qualify. Of course you can say Manchester United need to be champions, yes I know the expectations are like that but I don't think that is realistic." 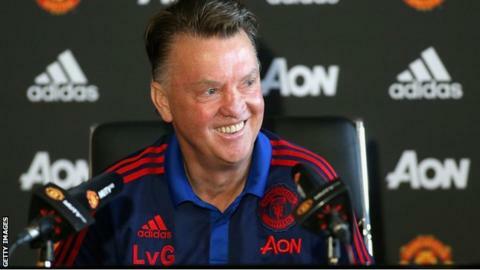 Van Gaal repeated his assertion that the media "sacked" him six months ago. And whether he stays or not, Van Gaal has already been heavily involved in planning for the 2016-17 campaign, reducing the club's pre-season tour to six full days and two matches in China. He also knows the area he needs to strengthen, having backed out of a potential deal for Renato Sanches, who joined Bayern Munich from Benfica on Tuesday. "I don't think we have to improve too much," he said. "But we need fast, creative players in attack. That is what I said before this season." Never want to miss the latest Manchester United news? You can now add United and all the other sports and teams you follow to your personalised My Sport home.